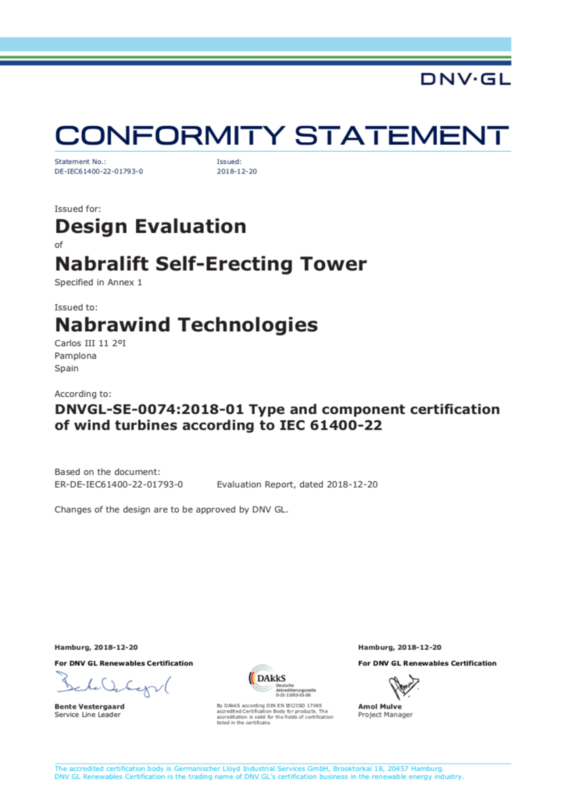 The certificate confirms that the tower frame structure, designed to be used in 3MW turbines, is designed in conformity with the requirements set in the last generation of DNV-GL standards. The strength of the structure has been verified not only for the most critical situations during the operation of the wind turbine, but also during the erection of the turbine under high wind conditions, using Nabrawind’s patented Self-Erecting System. All the bolted connections of the frame structure are certified as maintenance-free, what removes the expensive maintenance tasks of traditional lattice towers. This certificate confirms also the steps for the integration of our tower designs into Type Certificates of existing or new wind turbines, setting a clear roadmap for the development and certification of the first commercial Nabralift towers.